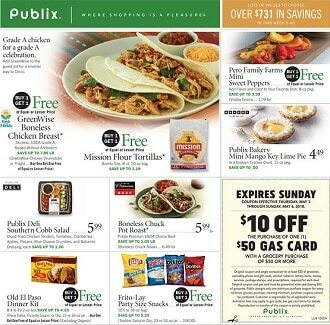 View Publix Weekly Ad sale specials, valid Thursday, April 11 – Wednesday, April 20, 2019. Don’t miss the Publix BOGO Sale, digital coupons and online deals & offers from the current Ad Circular. With stores were shopping is a pleasure, also get super savings and super values to choose from like GreenWise products, USDA Choice Ribeye Steaks, Fresh Mussels, Buitoni Filled Pasta, Florida Sweet Corn, Marzetti Dressing, Asparagus, Organic Blackberries, Assorted Italian Cookies, Manchego Cheese, Coca-Cola Products, and more.